The longer I'm at National Fatherhood Initiative (NFI), the more evidence piles up that shows how devastating having an incarcerated parent is for children. "That significant health problems and behavioral issues were associated with the children of incarcerated parents, and that parental incarceration may be more harmful to children's health than divorce or death of a parent...'These kids are saddled with disadvantages,' said Kristin Turney, the author of the study and an assistant professor of sociology at UC-Irvine. 'They're not only dealing with parental incarceration, but also mental health issues. It might make finding a job more difficult, or they may be forced to grow up faster than peers.' Compared to children of similar demographic, socioeconomic and familial characteristics, the study found that having a parent in prison was associated with children's behavioral problems and conditions such as attention deficit hyperactivity disorder, learning disabilities, speech or language problems and developmental delays." We've known for decades that having an incarcerated parent places children at a greater risk for a host of poor outcomes compared with children whose parents aren't incarcerated. That's the primary reason NFI has equipped hundreds of correctional facilities, halfway houses, and re-entry programs and organizations with programs and other resources to help connect incarcerated fathers to their children and families prior to and after release. The fact that 25 states have standardized our InsideOut Dad® program across their facilities for men is a testament to how vital this work truly is. But when I add the results of this study to what we already know about the devastating impact of parental incarceration, I want to ensure that every state department of corrections standardizes on our InsideOut Dad program. I also want every county or city jail that houses fathers and every re-entry program that helps incarcerated fathers reenter society to understand how much impact they can have on improving child well-being by using our programs and resources to help incarcerated fathers be better dads. Unrealistic? Perhaps. But it's an objective worth pursuing. Please join me in achieving that objective. 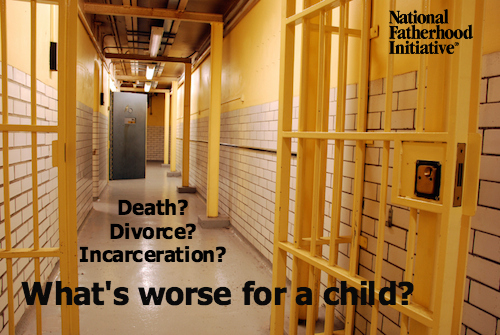 What are you doing to help the children of incarcerated fathers? What are you doing to help incarcerated fathers be better dads?